In this deleted scene from the 18th episode (1:00 AM to 2:00 AM) of 24 Season 7, Renee Walker tells Kim Bauer that her father is sick. The scene was cut for time as the episode was too long and this information would be repeated anyway when Kim meets Jack. 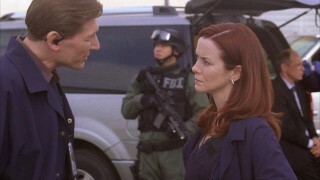 Producers also felt that the scene between Renee and Jack would be a more dramatic way to reveal this information. Renee Walker: Kim, I’m Agent Walker. Kim Bauer: Hi. I can’t imagine how busy you are right now with everything that’s happened. But this man won’t let me see my father – he said you told him to keep me here. Renee Walker: Yes, I wanted to see you first. Renee Walker: (to FBI guard) Could you excuse us, please? Kim, look, I’m sorry it’s taken me so long to call you back. I know that you’ve been looking for your father since this morning. Kim Bauer: Yeah, by the time I’ve got to the Senate Chambers they had told me that the FBI had already pulled him out. I’ve been leaving all kinds of messages trying to find out what’s going on. Renee Walker: Your father has been helping us in the field. The truth is, I haven’t even told him that you’ve called. Renee Walker: I can’t disclose all the details, but your father was involved in the recovery of a weaponized pathogen – and during the operation, he was exposed. Renee Walker: He’s been infected, Kim. He’s sick. Kim Bauer: There must be some kind of treatment. Renee Walker: There is. It’s an experimental stem cell therapy that requires a compatible donor. The chances of remission are still very, very low. Kim Bauer: At least there’s a chance. Renee Walker: The thing is, your father doesn’t know that you’re here. He doesn’t want you to know that he’s sick. Kim Bauer: That’s my fault. The last time I saw him, I told him that I didn’t want him in my life. And the truth is, I’ve been trying to find him for the last year. I didn’t even know he was in this country until I saw him on the news today. I need to see my father, Agent Walker. But I don’t want to ambush him – you have to tell him that I’m here. Renee Walker: Alright. Wait here, I’ll bring him to you.